"You ask why I'm fascinated by the human figure? As a human animal, I am interested in some of my fellow animals: in their minds and bodies." "I want paint to work as flesh." "My work is purely autobiographical... It is about myself and my surroundings." "I began again, after some years, to learn to draw, mainly from life, at what I will call a higher pitch, a pitch of some ambition and skill and quality. I sought to train myself to achieve the kind of drawing many modernists I admired had done in their early years, well before their iconoclastic periods." "Faces are the most interesting things we see; other people fascinate me, and the most interesting aspect of other people - the point where we go inside them - is the face. It tells all." "What I am trying to make is a stonking, independent, coherent image that has never been seen before...that stalks into the world like a new monster." "What I wanted to do was to record the life that seemed to me to be passionate and exciting and disappearing all the time." "This part of London is my world. I've been wandering around these streets for so long that I've become attached to them and as fond of them as people are to their pets." 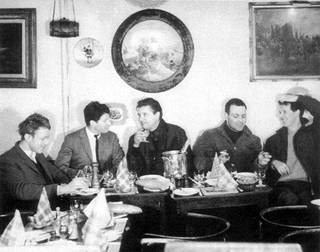 John Deakin's Lunch at Wheeler's (1962) shows (from left to right) Timothy Behrens, Lucian Freud, Francis Bacon, Frank Auerbach, and Michael Andrews, having lunch at Wheeler's, an oyster Bar in Soho, London. Most consider Francis Bacon to be the leader of the School of London group; certainly, he was the most successful figurative artist at the time, and his artistic influence was indisputable. Charming and affable, he also became the social hub of "The School", a group marked by close friendships, as they often gathered in Soho at Bacon's favorite places, the Colony Room in the evenings and Wheeler's, an oyster bar, for lunch. 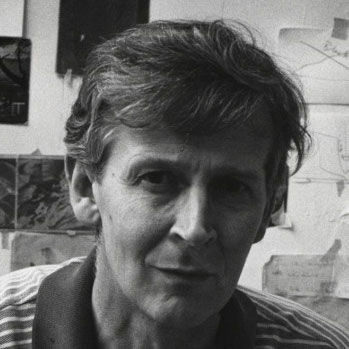 The friendship between Bacon and Lucian Freud was particularly important for the group as well as the two artists' artistic developments. The two men first met in the mid-1940s, and they saw each other nearly every day for the next three decades, both socially and in the studio critiquing each other's work. They painted noted portraits of one another, one of the first being Bacon's Portrait of Lucian Freud (1951), as well as of the denizens of their Soho haunts, as seen in Freud's Portrait of a Man (1955) depicting Bernard Walsh, the owner of Wheeler's. The Soho neighborhood seemed to encapsulate the rawness and vigor of London, informing the works of the School of London. 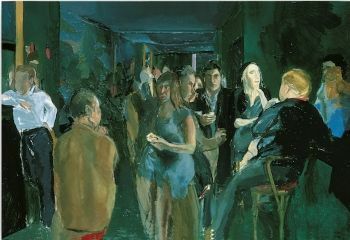 Michael Andrews Colony Room I (1962) shows Francis Bacon (right foreground, back to viewer) looking toward Muriel Belcher striking a pose at the bar, while Lucian Freud to her right looks out at the viewer, and the model Henrietta Moraes in a blue dress is in the center. While the relationship between Freud and Bacon was crucial, so too was David Hockney and R. B. Kitaj's lifelong friendship, and significantly, both were important to British Pop Art circles, creating valuable contacts with other artists. They met in 1959 as students at the Royal College and mutually influenced each other's work. Hockney credited Kitaj with his own move toward figurative art when he painted We Two Boys Together Clinging (1961). Even though the group consisted of diverse artists, certain commonalities existed, including: the influence of Old Master figurative painting, the use of photography, and their experiences of post-war London culture. While all of the artists associated with the School of London were individualistic in style, the European masters influenced all of them. 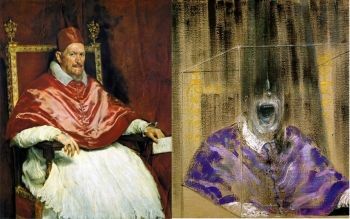 Francis Bacon, the most famous of the group, was influenced by a number of Old Masters throughout his career, including Nicolas Poussin, Francisco de Goya, and Rembrandt, but the most significant and long-lasting influence was that of Diego Velázquez, whose Portrait of Pope Innocent X (1650) was famously referenced in a series of works by Bacon such as Head VI (1949). As Bacon said, "Velázquez found the perfect balance between the ideal illustration which he was required to produce, and the overwhelming emotion he aroused in the spectator." Bacon was not the only School of London painter influenced by the Spanish master, as Michael Andrews' Deer Park (1962), depicting famous people as if within an outdoor enclosure, was derived from the Spanish artist's La Tela Real (King Philip IV hunting Wild Boar) (1632-1637) that portrays a similar gathering of notables in an enclosure to hunt the animals. Lucian Freud, known for his psychological portraits of close friends, intimates, and family members was particularly influenced by Leonardo da Vinci and his statement "Every artist paints himself." The precise lines of Jean-Auguste-Dominique Ingres, and the portraits of Rembrandt were also important touchstones for him. Rembrandt, Titian, and Rubens influenced Auerbach, as reflected in his Bacchus and Ariadne (1971), referencing Titian's painting of the same name from 1522-1523, and his After Rubens' Samson and Delilah (1993). As the art curator Richard Calvocoressi wrote, "If there is a single source of inspiration common to all six artists, it is that treatment of the great universal themes of human existence to be found in the paintings of the Old Masters." 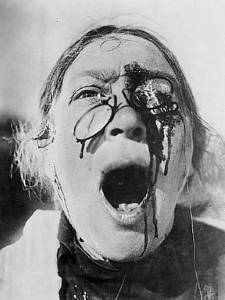 Francis Bacon kept a copy of this still from Sergei Eisenstein's The Battleship Potemkin (1925) in his studio and described it as a catalyst for his many works that incorporated a screaming mouth. Photography and film significantly influenced the School of London painters. Michael Andrews often worked from photographs; his The Deer Park (1962) included portraits of the poet Arthur Rimbaud and of celebrities like Marilyn Monroe taken from photographs. Hockney worked from his own photographs in creating Mr. and Mrs. Clark and Percy (1970-1971). The fusion of the modern medium of photography with the influence of the Old Masters was a significant artistic contribution of the School of London. R.B. Kitaj's screen-print Photographs and Philosophy (1963-1964) incorporates a montage of photographs. R.B. 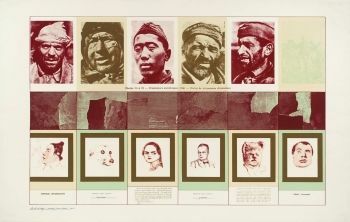 Kitaj's Photographs and Philosophy (1963-1964) is a screen-print of a collage of various photographs that include portraits of Russian prisoners from a German propaganda film, landscape photos of cliffs, and reproductions of the artist's own drawings. Kitaj said that films were "the only aspect of pop that ever meant anything to me. Films connect me more to my own time," and that he preferred to use "frame enlargements, rather than stills. I look at them, synthesize them, use details if I need them." In the early 1980s, David Hockney's interest in photography, led him to combine Polaroid images in collages that he dubbed "joiners," like Mother I, Yorkshire Moors, August 1985 No.1 (1985). 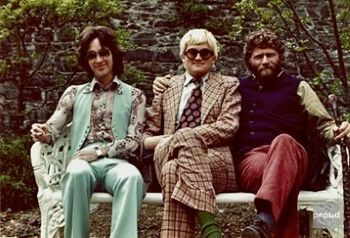 Peter Schlesinger's photograph Ossie Clark with David Hockney & R.B. Kitaj (1970) shows (left to right) the renowned fashion designer Ossie Clark with the two painters. Another dominant influence for the School of London painters was popular culture, as primarily seen in the work of David Hockney and R.B. Kitaj. Popular photographs and films were essential to their works, and both drew from literary referents, sometimes incorporating lines of text into their works. Kitaj's work often pointed to literary texts; his complex If Not, Not (1975-1976) refers to T.S. Eliot's famous poem The Waste Land (1922) and includes a portrait of the poet. While the School of London emphasized figurative work, they also depicted the landscape of London after the bombing and destruction of the city in World War II. During the reconstruction era from the 1950s-1960s, in the urban setting ruin and transition were everywhere, and artists like Kossoff and Auerbach used thick impasto styles to paint familiar places that turned into a kind of portrait of the city. Even when painting interiors, the School of London's representational treatments captured the gritty atmosphere and setting of post-war London, as seen in Andrews' The Colony Room I (1962), and conveyed the feeling of desolate emptiness that captured the ruin of the war as seen in Bacon's Sleeping Figure, with its figure confined in a sterile battleship grey room. While the artists had been socializing for years, it wasn't until 1976 that they got a group moniker. The British Arts Council asked Kitaj to buy art for their permanent collection and simultaneously to organize a group exhibition of contemporary arts at the Hayward Gallery in London. Organizing the show that would become The Human Clay, Kitaj emphasized art that focused on "people and the single human form." The exhibition's title was taken from a line of a poem by W. H. Auden: "To me Art's subject is the human clay." Kitaj credited the line to Hockney's influence, as it was one that the artist often quoted. The School of London came to be seen a part of a larger trend in European and American art, dubbed New Spirit Painting, which took its name from the 1981 exhibition, A New Spirit in Painting, at the Royal Academy of Arts in London. The exhibition was intended to be a complete showing of contemporary painting and brought together the British figurative artists, such as Kitaj, Freud, and Bacon, with the Neo-Expressionist German artists of that era, including Anselm Kiefer, Georg Baselitz, and Gerhard Richter, as well as works by American artists Willem de Kooning, Frank Stella, and Julian Schnabel. Each artist was represented by four works, and over 38 artists were included, categorized by their generations. Subsequently, the term New Spirit Painting had a two-pronged use; it was taken to be somewhat synonymous with Neo-Expressionism in general but primarily used in Britain to denote works that did not completely fit into that movement. Accordingly, the term in Britain came to characterize a revival of interest in figurative painting that both drew upon and renewed interest in the artists of the London School, including Freud, Bacon, Kitaj, and Hodgkin. The 1981 Royal Academy exhibit was followed by the Tate Gallery's The Hard-Won Image: Traditional Method and Subject in Recent British Art and the 1990 The Pursuit of the Real: British Figurative Painting from Sickert to Bacon at the Manchester City Art Galleries, further establishing the centrality of British figurative art as part of the "new spirit" in contemporary art. 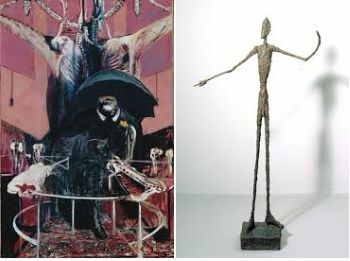 Left: Francis Bacon's Painting (1946) Right: Alberto Giacometti's Man Pointing (1947) These two works highlight a very different artistic approach to an existentialist theme. During the post-war era, the dominant philosophy became existentialism, as expressed in the writing of the French authors, Jean-Paul Sartre and Albert Camus. Essentially, the philosophy posited that in the absence of knowing any absolute truth or God, the individual was free to struggle and choose in an uncertain and despairing world. The School of London portrayed existentialist themes by emphasizing what Francis Bacon called, "the brutality of fact." Bacon's haunting Painting (1946) depicts humanity as a brutal and visceral presence with an unidentifiable man posed in front of a flayed piece of meat. Frank Auerbach's works like Head of E.O.W. 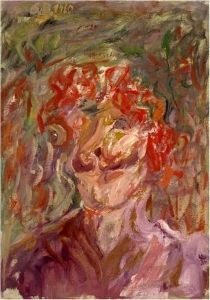 (1961), an impasto representation of Stella West, with whom he had an intense and lifelong relationship, express his feeling that the struggle with the materiality of paint was an attempt to find meaning and order in the chaos of existence. The School of London artists were not alone in exploring existentialist themes in their art. Most famously, the Swiss sculptor Alberto Giacometti, a close friend of Sartre, created figures, like Man Pointing (1947), that embodied the essence of Existentialism, conveying a sense of alienated fragility and isolation. The sculptor's emaciated figures, with their rough agitated surfaces, engaged in activities like pointing or walking, created a typology of modern suffering, reduced to the simplest acts of the will. In contrast, the School of London's emphasis was, as the art critic Jonathan Jones said of Bacon's works, "brutally exposing the fragility of flesh - and...that flesh is all we are." The School of London portrayed, often in multiple works, the important people in their lives. 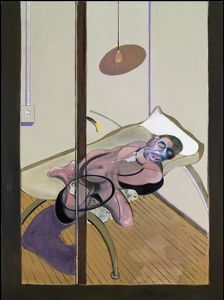 Freud's Hotel Bedroom (1954), combining a self-portrait with a portrait of his then lover, evinces the detachment and self-absorption that characterized his work. Hockney's American Collectors (Fred and Marcia Weisman) (1968), showing his friends as almost static figures among their prized possessions, is simultaneously a witty and ironic cultural commentary. Georg Baselitz's Portrait de Rayski III (1960) alludes to the 19th-century German painter, Ferdinand von Rayski. Other artists associated with the New Spirit painting also turned to portraiture in the post-war period, including German artists like Georg Baselitz. In 1958, Baselitz began painting imaginary portraits, inspired by war soldiers and emphasizing German post-war identity, and followed with his Rayski Head series (1960-61). Like the School of London artists, Auerbach and Bacon, Baselitz also used thick pigment and aggressive brushstrokes in his portraits to convey a distorted and disturbing humanity. Baselitz, like other Neo-Expressionists, explored German history and identity in his painting. Baselitz remarked, "I proceed from a state of disharmony, from ugly things." While the School of London similarly emphasized the disquieting, they did not create archetypes or imaginary portraits, instead concentrating on those they knew. 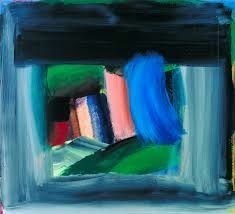 Howard Hodgkin's Rain (1984-1989) exemplifies the jewel-like colors for which his abstract work was known. While the School of London at its inception was often posited as countering the abstraction and minimalism of the era, some painters associated with the group, like Howard Hodgkin, became known primarily for their abstract work. In works like Rain (1984-1989), broad brushstrokes create an energetic framing of other shapes in varying colors vertically and horizontally. Hodgkin was influenced by American painter Barnett Newman's large-scale Color Field work. In contrast, Hodgkin's work usually were small scale canvases with large brush strokes. While seemingly contrary to the emphasis on human experience, art director Nicholas Cullinan explains that Hodgkin's "work often appears entirely abstract, yet over the course of 65 years a principle concern of his art has been to evoke a human presence." R. B. Kitaj, later in his career, also created abstract works like My Third Jewish Abstract (God's Back) (2001), depicting a white bell-like shape framed by torn and curving planes of varying shades of red and is suggestive of a human figure. While the abstract works of the School of London artists emphasized form and color, their work always had a representational subject in mind, even if only vestigially present. With A New Spirit in Painting and the following exhibitions, the School of London influenced a new generation of British painters, including Jonathan Yeo, Nigel Cooke, Tony Bevan, Glenys Johnson, Hughie O'Donoghue, and Antony Micallet. For instance, O'Donoghue's Liquid Earth (1984) reflects Auerbach's use of thick paint to convey the materiality of a landscape where peat bog men have been impressed into the earth. As the School of London included Bacon, Freud, and Hockney, among the most critically celebrated artists of the last fifty years, each of those artists also had a significant influence. Hockney, who has been called the most influential artist by contemporary British art students, has also inspired artists like Chuck Close, Cecily Brown, and Martin Scorsese, the noted film director. Francis Bacon was a major influence upon Jake and Dinos Chapman, Damien Hirst, and Jenny Saville, whereas Freud influenced John Currin, Eric Fischl, Elizabeth Peyton, and Luc Tuymans. Other artists of the School of London also influenced later generations, as seen in British artist Glenn Brown's The Day The World Turned Auerbach (1991), which acknowledged the older artist's iconic London landscapes within an ironic reconceptualization. The work of the Young British Artists (YBAs), a group that includes Hirst, along with Gary Hume, Anya Gallacio, The Chapman brothers, and Sarah Lucas, all of whom attended Goldsmiths Art College in London, were influenced by the School of London's existential preoccupation with death, the fascination with flesh, and autobiographical emphasis. The YBAs even gathered at The Colony Club, which had come under new management, continuing its reputation as a social artistic hub until 2008 when it finally closed. Kossoff's paintings of London, often derelict and gritty, have influenced Keith Coventry's projects of "council housing estates." An exhibition Beyond the Human Clay in 2011, brought together the works of the School of London with works by subsequent artists, including Peter Doig, Chris Ofili, and Jenny Saville, as well as works by two emerging contemporary artists, Lewis Chamberlain and Ben Spiers. As a result, The School of London continues to influence contemporary art that draws upon figurative elements.